This morning, I was driven to write, amongst the tears I am shedding. I was watching the Pope address the crowds at Castel Gondolfo this morning and he said (paraphrased here) ” I am now just a fellow pilgrim on my journey to my final destination.” It made me weep. I am weeping because my stepdad, who is very loved, is entering hospice today, to also begin his pilgrimage to his final destination. And I could not help but notice the parallels between the two men. Pope Benedict looked so frail and weak as he climbed aboard his helicopter and then again, when he entered the cars waiting for him after his short flight from the Vatican, to his final home at Castel Gondolfo. He was peaceful but obviously tired, as he addressed the crowds waiting to hear, and cling to, his final words as Pope. The weight of office has certainly wreaked havoc on his physical health. My stepdad has been valiantly fighting cancer for the past 11 months. The doctors see no purpose in further exposure to chemo-therapy and feel that they can do no more for him, other than to keep him comfortable. My step-sister and I chatted, wept, laughed, and cried about her dad yesterday; it was a good conversation. He has been such a powerful personality in my life for the past 30 years, that realizing I may never hear one of his silly stories, or hear his laughter again, leaves a major hole in my life. My sons adore him as well. He always made us laugh and my mom used to roll her eyes and just sigh, having heard his stories and jokes countless times. But he also had her well in hand and has helped her to become a kinder, gentler woman in these past 30 years. He used to say, when she would go off on some tangent and be angry, “Oh Maureen, put a sock in it!” The first time he did that, I could not help but laugh and laugh. Seeing the “pin” pop my mom’s balloon was hilarious. All the starch would go out of her anger and she would look at him and just smile. He has been so good for her. He has insisted they attend Mass and has been receiving the sacraments regularly since making a confession and regularizing their relationship several years ago. The priest has been coming every Sunday with communion for him and my step-sister told me he received anointing, and had a good confession and communion, this past Sunday; it warmed my heart. After their last doctor’s appointment, my step-sister said he was “not ready to throw up the white flag.” That is so him! But after consultation with hospice specialists, he agreed that it was time and today, he begins his final journey. And I am sad, very sad. I posted that picture above because it made me think of how we all face our final judgement – alone. Family may be beside us, but we all enter into our final conversation with God. With my father-in-law last year, that became more and more evident as his time with us drew to an end; he was already in deep conversation with God. The photo reminds me of the Pope, beginning his final days in solitude; and my stepdad, his final days in hospice at home, with my mom. This all, of course, has me thinking. We are all blessed to watch the journey not only that we make towards our own eternity, but the journeys others make alongside us. Watching someone like Pope Benedict struggle with the cross that was presented to him in the office of the Pope (something it seems to me he did not want and was not particularly suited to), or friends and family members who choose to put off getting their lives in order and are still struggling in this world, and people like my stepdad, who have struggled and are at the end of their journey. We can all learn from the struggles of those around us. Often incorrigible youth are taken to prisons, where the inmates, “scare them straight.” I think that watching the world around us should scare all of us “straight.” I know I am scared and am working diligently to “get my house in order.” And I am deeply in prayer for the Pope, as he settles into a cloistered existence of reading, writing, and continued prayer for the world. And I am also entering into a time of focused prayer for my stepdad, as he enters this final stage of his pilgrimage. Elder Thaddeus tells us that God doesn’t need our prayers; He wants our prayers. He knows our sinfulness first hand and is just waiting for us to acknowledge it before Him. 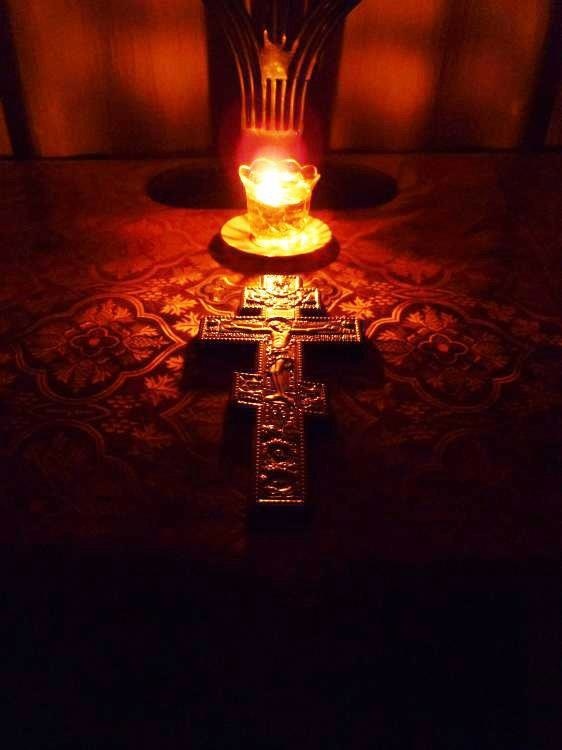 Sometimes when we are troubled or need to focus our thoughts, it has been said we need a “focal,” like a lit candle in front of a cross or perhaps an Icon, gently lit by candles. I find that candles and dimly lit rooms helps me to calm my mind and allows me to focus my thoughts on what I need to chat with God about. Elder Thaddeus tells us that prayer should be like talking to our Parent, our Father, in a very personal way. God knows our thoughts, so trying to gel them into something coherent is not necessary for God to understand our coming to Him in prayer, but it helps us to focus our issues and perhaps even to whittle them down to something tangible. For me, I often find myself rattled over things like budgeting for things that are coming up, and trying to manage our household in a thrifty way, to secure our future. More often than not, when I actually dive into a spread sheet, things are much simpler and not as horrid as I thought. Numbers arranged in pluses and minuses is somehow easier to manage than my imagining it! Our minds are powerful things that can carry us off into waters we needn’t necessarily be wading into. 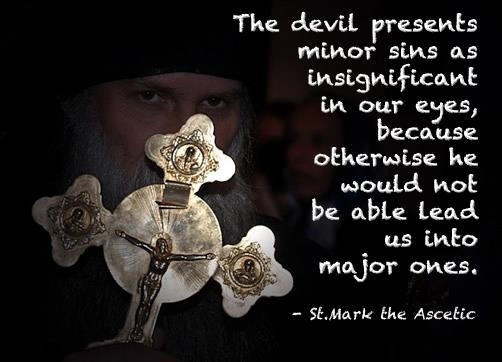 Which is why my Lenten reading is more important than ever for my peace of mind! As I was waiting for a friend last night (we try to meet about monthly while I wait for my son at his CAP meeting) I was enjoying a nice cup of Hazelnut Latte (easy on the hazelnut) and reading Elder Thaddeus. His book is great in that you read it in sections, and within those sections are numbered items he is relating to that topic. It is almost like a tabletop book you can easily pick up, except that the content is pretty “heavy” at times. Earlier in the day I was waiting at the DMV while we got my son an ID card and one of the workers called out to me, “What are you reading?” I did not realize, at first, he was speaking to me, but when I looked around me, he continued, “Yeah, you; you’re the only one in here with a book.” When I told him the title (again, Elder Thaddeus), he shrugged it off, more interested in why I was reading a book instead of using a “Nook” or “Kindle.” He has no use for books, so my reasoning did not interest him in the least. I tried to explain that I love books and love the process of reading from one. I feel so much more connected to the toils of the author and the words contained inside the pages, if I am holding the book. My son has a funny habit of smelling a book before he buys it. He insists that if it does not feel right in his hands or smell right, it won’t be a good read. I have met many others who feel the exact same way! And I am clinging to the process of reading a book from a book, rather than an electronic reader. I just do not want to switch over. The content of Elder Thaddeus’ book would seem to agree with me, in that he is always cautioning us, in all things, to be simpler and quieter. Therefore, using an electronic device to read that seems somehow wrong to the intent of the book. 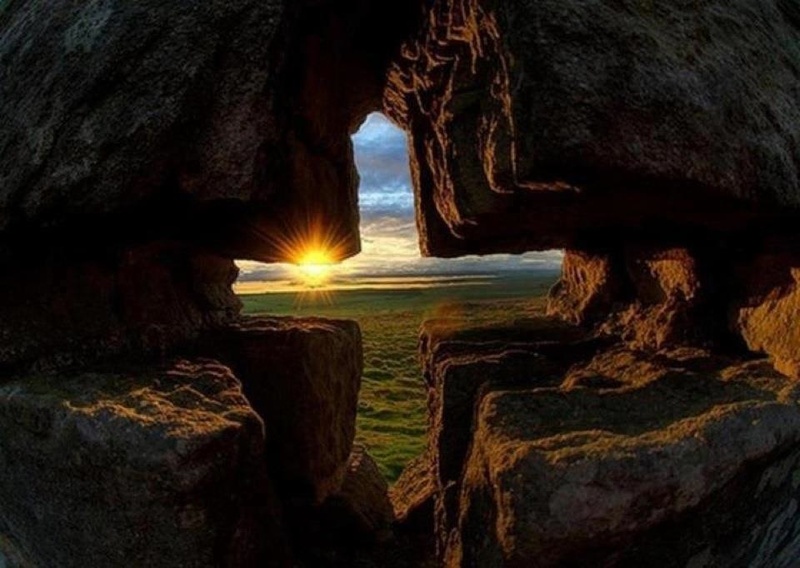 This morning I am all a-twitter over our immediate future and am praying almost non-stop, “Jesus, Son of God, have mercy on me, a sinner.” The “Jesus Prayer,” or “Prayer of the Heart,” is an ancient way of connecting to our Lord. As I drove across town to the CAP meeting last night, I had the radio turned off and used my fingers on the wheel to tap out each time I prayed that prayer. What I do is start by offering the prayer for a particular intention, and then just keep praying. I know God is listening and is pleased by the words I am using, but much, much more is occurring while I pray. I found that last night, as I was driving and praying, I was also thinking about what I was praying about. It was an amazing thing. I actually could still feel myself tapping out the prayer each time I said it, with my fingers, and I also knew I was driving and that I was talking to God on a completely different level. The traffic did not stress me out; I was able to answer my son when he asked me questions from the back seat (where he was, of course, watching a movie on the DVD player); I was also able to continue praying. My mind was settled and my heart was clear – and it was amazing. I did not allow the distractions of the world to stop me from continuing my prayer. Elder Thaddeus says “Because God is everywhere, the fallen spirits cannot do what they want. They can harm us mostly through other people. We can protect ourselves from them only with the power of God. Man has been given great strength, and if only we could concentrate our thoughts in prayer, the fallen spirits would not be able to harm us or do anything contrary to the Will of God. Where there is prayer, the fallen spirits have no power.” I know that God allows distraction and temptation in our lives in order to strengthen us, and it is amazing to witness inside your heart, the power of that prayer to overcome the distractions in life. 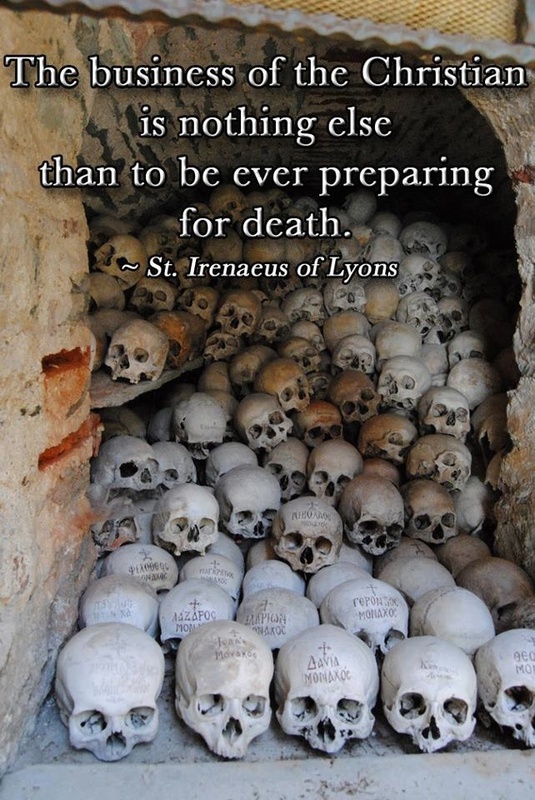 To some, most especially my Protestant friends and family members, the practice of many Orthodox and Byzantines of having an “ossuary” (An ossuary is a chest, building, well, or site made to serve as the final resting place of human skeletal remains. They are frequently used where burial space is scarce. A body is first buried in a temporary grave, then after some years the skeletal remains are removed and placed in an ossuary. The greatly reduced space taken up by an ossuary means that it is possible to store the remains of many more people in a single tomb than if the original coffins were left as is) to remember the dead seems highly morbid or gross. In addition to that, many of the skulls kept in an ossuary are engraved with the deceased’s name and birth/death information. In many places around the world, cemeteries are a luxury that cannot be afford to a particular place or situation, or perhaps for financial reasons. In the USA, we often have crypts or mausoleums where we inter our deceased in caskets. Lots of people do not want to be placed in the ground, or perhaps they choose cremation. 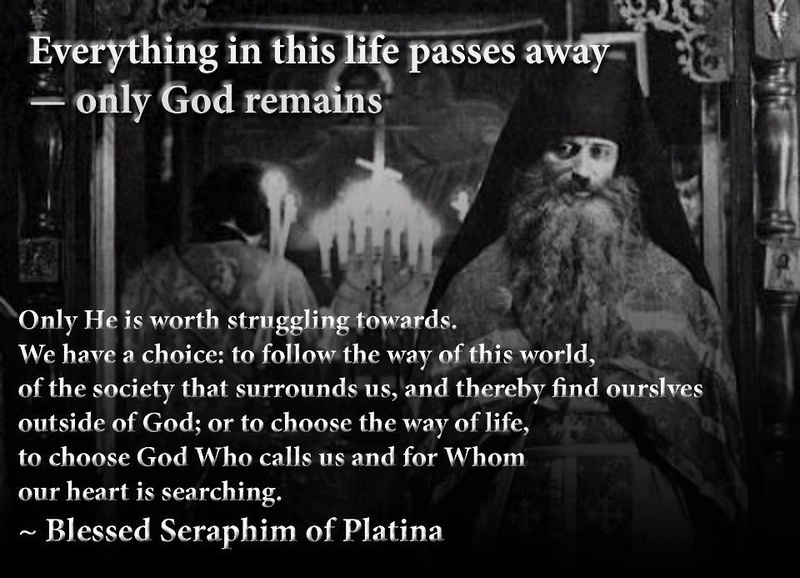 In Orthodoxy in particular, we do not cremate. In the Byzantine tradition, it is not favored, but is allowable. There has been a return, in recent years, to simplicity in burial and to even “green” caskets, where the casket actually decomposes over the years so as to not add to the landfill and allow the remains to be returned “from whence they came,” as in “ashes to ashes, and dust to dust.” I met an incredible man at a homeschool conference a couple of years ago. He was a boat maker and he loved wood carving and working with wood. He watched Pope John Paul II’s funeral on TV and was moved by the simplicity of his casket. It moved him so much, he relocated his family to Vashon Island in Washington state and providing these amazing caskets has become his life’s work. 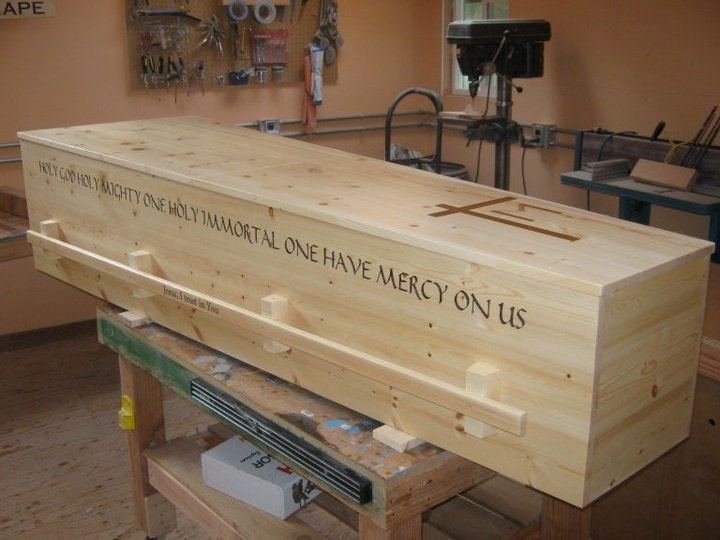 (You can find him at http://www.mariancaskets.com/ and I highly recommend his magnificent and simple caskets). When I first saw one at our conference up here, I stood next to it and wept – the simplicity and beauty were overwhelming. It seems odd to recommend someone get in touch with a casket maker, even if there is no impending death, but these caskets are one-of-a-kind and are each handmade with craftsman-like attention to detail. Very worth planning for!! Today marks one year since the death of my father-in-law. He was diagnosed with cancer and exactly (I mean to the day of his diagnosis) two months later, he had passed on into life eternal. (May his memory be eternal). He changed quite dramatically in the small period of time in which he was ill. There were good days and there were some pretty bad days. Through days of pain, his demeanor was that of a man who knew his days were few, and was peaceful. Most importantly to all of us, he had made peace with God, and it was evident to all of us around him. [A side note in all this was that he even encouraged his wife to get rid of things in their home, saying it was just “stuff” – a HUGE thing in our family.] He also actively participated in the choices that were made regarding his last days, his burial, and his internment. He was calm and resigned, but more importantly, he was peaceful, and at times even joyful. He gathered his family around him, he expressed his love for each of them, and he said his goodbyes. He was the eldest of 10 children and each of his siblings that could, came to see him and spend a short amount of time with him, bidding him farewell. He had his wife, sons and daughter all around him at one time, which was miraculous considering we resided in several states, and had so many complications in getting together. (My sister-in-law had just given birth to twins, but was able to fly out to spend some time with her dad). All of my sons were there, and my oldest son brought his wife and newborn baby, so that my father-in-law could meet his great-grandson. It was beautiful. And when he took his last breath, the Kaiser world was rocked. He had, probably without even realizing it, become the planet we all revolved around…his siblings, his grandchildren, god children, nieces and nephews, various in-laws and outlaws, and friends he’d kept since early childhood. His funeral was beautiful and his internment quiet and peaceful. He was laid to rest in peace, and it was a celebration of his life. The year since his death has been one of so many wonderful occurrences in our immediate family – we’ve had the college graduation and wedding of our middle son, and now his impending fatherhood. Our oldest son’s firstborn son celebrated his first birthday a month ago, and now we are awaiting the birth of his second child. Our youngest son became a member of CAP and entered his middle teens going full blast, challenging us and keeping us on our toes every day! My husband changed jobs late last year, is changing jobs again, and now we are moving thousands of miles from here. For me, it was a big year in that I started blogging! Our lives are in full swing. My father-in-law has left us a legacy, and a lesson. A priest we know used to love to say, “You are not guaranteed your next breath.” I believe that when my father-in-law breathed that last breath, he was willingly walking towards his eternity in peace and fully engaged in the process of “meeting his Maker.” I pray that I, too, keep my eye on meeting my maker and that each moment of every choice laid before me is spent spiritually aware and is profitable to my salvation. I was also shown through the experience of the death of my father-in-law, that family is the single most important thing Our Lord gave us. Everything we learn about who we are, everything that we have been given, has come through our family. I am now determined to keep family close by me, and I never tire of telling my family that I love them. Lent is always a rough time of year; it is especially rough this year because we are in mourning, at the one-year anniversary of someone who was pivotal in so many of our lives. My husband, youngest son, and I had lunch together today and my husband was able to share tidbits with our son about his father. And he was able to smile; we even laughed a little bit. It is good to smile and laugh when we contemplate those who have gone before us, rather than always to mourn. Today our middle son had an interview and it was a little nerve-wracking (he really wants this job). We chatted a little about invoking the saint names of my father-in-law and asking them to intercede for my son. Although a year ago today my son was sitting with him as he passed away, today he can ask his grandpa to spiritually sit with him in his interview. What a wonderful gift!! Our faith is not an easy thing, but it is also such a comfort on days like today. So today I remember my father-in-law and ask his prayers for the family he has left behind. I pray for his soul and wish him peace and repose. I also am more focused on my own path to salvation, as this time of Lent gives me so much to reflect upon and pray about. God is working in our lives and He has a plan for us. When we contemplate our own death in light of those we love who’ve gone before us, it makes our own struggle seem much more real, and very timely. The days grow shorter for each of us and I pray that each day I have, God will manifest Himself in me more and more, and that everyone will know I am a Christian, by the love that emanates from me towards all those around me. My prayers go out today to our family-at-large and “May the souls of the faithful departed rest in peace. Amen.” Memory eternal, Joe…. I laid in bed last night, writing this blog in my head. Then I laughed at myself, because I rarely remember what I want to say. Sometimes it feels like there is just this empty void where certain memories used to reside, and then I think about that and pray it is just because I am trying too hard to remember them. The old saying, “Just do other things and it will come to you,” sort of kicks in. I think I am becoming less and less able to multi-task these days! I did, however, surprise myself this morning and remembered the gist of what I wanted to write about today. Elder Thaddeus has been such a tremendous help to me this Lent. I am really working on emptying my mind when negativity creeps, or tries to creep, inside my head. I envision one of my favorite Icons of Christ and then I just relax. It is pretty amazing. I found myself a little angry at my husband yesterday for a supposed embarrassment to me, and I just focused on the Icon of Christ (Pantocrator – Greek for “The Almighty” or “Lord of Hosts”) and my anger sort of evaporated. And what it allowed me to do was give my husband feedback without my anger, and let him know my predicament of mind, and we could discuss it more calmly. And this is just the tip of the iceberg of the changes available to each of us, and to me, if we delve more deeply into our hearts and souls during these 40 days of Lent. 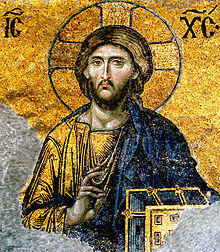 (That image of the Icon of Christ – Pantocrator – is from the Hagia Sophia). Sometimes it seems to me that we worry overmuch of what others think about us. I know I have always been concerned that others would not be interested enough in me to want to get to know me. And because I have grave doubts about my appearance (as being pretty, etc) I developed a very outgoing personality. I have this insatiable curiosity and am constantly adding trivial facts to my head, which I get such a kick out of doing, and love sharing them with others. My dad and I had a chat about this yesterday, because when you do share things you learn with others, they can often take it as braggadocio, when it is, in fact, not. (Something he struggles with, even at 86 years of age). Another blogger I admire (thehomeschoolmom) wrote recently that her children are often said to be too chatty. Their friends are not interested in all that her children wish to share. I find that homeschooled children are far more comfortable in conversing with all age groups, because they are not segregated by age in their learning environment, and they must engage in conversation so we mothers know if they are grasping the concepts we are teaching them. We engage our children in what they are learning and they, in turn, want to share their enthusiasm with others. When our children mix with public- or even private-school children, those children usually have no desire to talk about what they are learning in school. Which is sad! For me, I am a homeschooling mom and we are a unique breed. Most of us love learning and we love sharing information – and if we have lots of children, we are sharing that same information over and over again; but for us, it never becomes dull. Seeing the light in a child’s eye when they grasp something never gets old. Our enthusiasm sort of spills over into our lives. Most homeschooling moms are very comfortable chatting with other people and we love sharing. Partially because it is so nice to converse with people our own age after having schooled a passel of children all day, but mostly because we enjoy sharing. And we have so much more to talk about than what laundry soap we use! All this brings me back to my embarrassing moment. My husband was trying to let me know, within a conversation, that I was sharing too much information. Sometimes he just does not understand our need to share with each other (among homeschooling moms) and as he is out in public all day long, he thinks I sometimes talk too much. Granted, I do love a good chat! (Which is probably why blogging wordily comes easy for me). And although I was embarrassed by his methodology in correcting me, and the fact that I do believe he misunderstood my motivation, I do believe he was right in many ways (gee, I hope he was sitting down as he read this!!!) and I bow to that correction on this page. 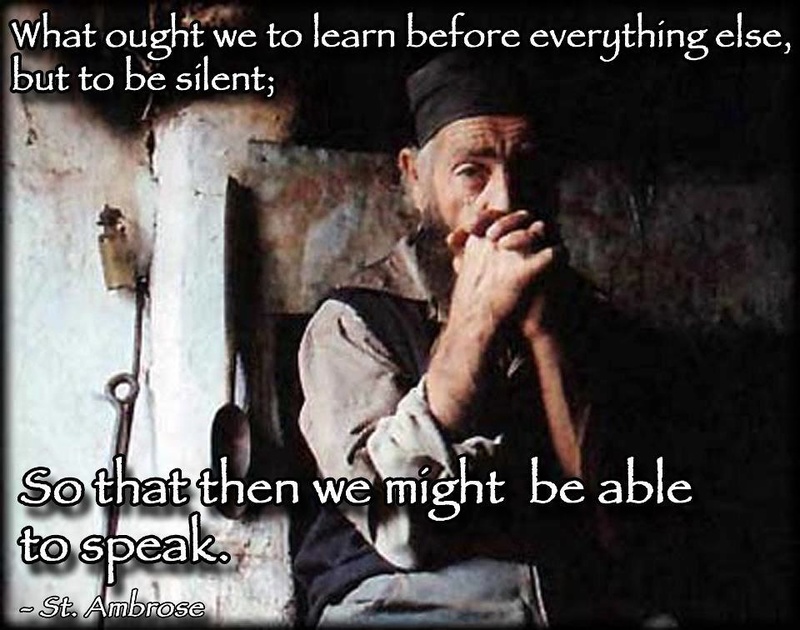 Elder Thaddeus cautions us that we need to listen more and speak less, which many, many philosophers have cautioned for countless generations. Think of the many adages we have concerning keeping silent: “Silence is golden;” “God gave us two eyes, two ears, and one mouth; we should use our mouths much less than our eyes and ears;” and on and on they go. And perhaps we women, even though science now says we have this extra hormone causing us to talk more, should practice less speaking and more listening, as a general rule of thumb! Occasionally God sends His Will to us through those who love us the most – our spouses. 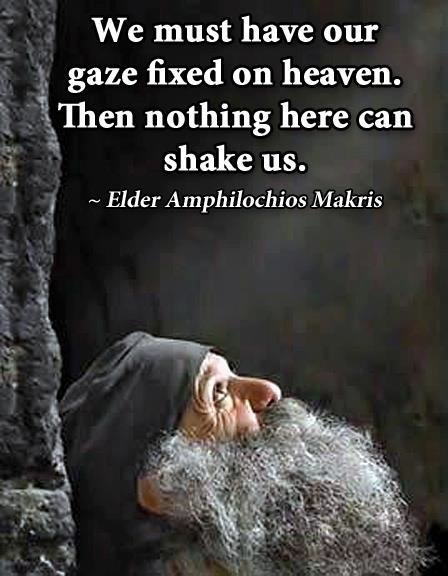 As Elder Amphilocios Makris says above, “Let Your will be done.” And boy oh boy, when you have a lifetime of chatting behind you, and the years stretch before you, it is hard to be quiet and submit to the Will of God. I do believe, however, that “we know that in all things God works for the good of those who love Him, who have been called according to His purpose.” (Romans 8:28) God called my husband to be my spouse, and for me to be his spouse; and I know that it is for my good and it is God’s purpose for us both. And I love learning new things about myself and applying them in my life. I would not have been as accepting of my husband’s words, nor would I have continued to ponder the moment, had I not dedicated my Lent to really working on improving the person I am. I like to think my efforts are reaping results, in that I feel them around me. Elder Thaddeus says that when we emote the joy, peace, and love that will fill our hearts when we practice control of our thoughts, it will affect those around us, without us having to speak. I think perhaps that is one of the fruits of this effort…the peace that fills my heart and hopefully emanates from me. *It rained 40 days and nights when God cleansed the earth; Noah waited another 40 days before opening a window on the Ark. *Moses spent 40 days (twice) on the Holy Mountain and his face shone with the Light of God. *The Israelites spent 40 years wandering in the desert, living off the Manna from Heaven. *Jonah warned the people of Nineveh that they had 40 days to fast and repent and they did, and God did not destroy them. *Jesus spent 40 days in the desert being tempted by the devil, and Jesus was seen 40 days after his Crucifixion, walking the earth. Those are pretty momentous moments in the history of Christianity and I believe our forty days of Lent can also be spent equally as momentously, should we so desire it. If I choose to make a momentous change in myself, I will have ample time to practice it the 16-21 times it requires to become habit, well before Lent is over, and in time for celebration at the Resurrection of Our Lord on Easter. And hopefully my new habit will become the fabric, the character, of the Christian woman I choose to be, which will in turn, become my destiny. It’s finally raining here in the Pacific Northwest. Now I know that those of you who think you are familiar with the area may giggle at that, but rain is an integral part of our lifestyle and the land we live on. The forests and trees depend on the rain; the livestock and vegetables we raise and grow depend on the wet weather to flourish. Our wineries need the water, too! (Believe it or not, we are becoming known for more than Starbucks here! There are amazing wines from Washington!!) We moved here from Southern California and I thought the rain would be like what I experienced down there; it rarely is. It is more of an annoyance, really. We wear things with hoods, just in case it rains. Very few of us use umbrellas because they are a pain to take around with you and you just never know when you will need one! I was caught once too many times without one, to keep on using them. I have various hooded outer-wear garments now and it is much simpler. It is amazing how we adapt to our environment, isn’t it? (And we like to keep the secret that rain is really not an issue here; it’s just an issue to visitors!) When we lived on dairy farms in the Chino basin of Southern California, the flies were never a problem. They were just another aspect of farm life and we dealt with them, with varying degrees of success, and much failure. We just lived with them; we cleaned up the dead ones and tried to prevent the live ones from coming in the house! When housing tracts were developed around the dairies, people living there complained about the flies. The dairyman’s response was, “We never had a fly problem until people moved here.” We all sort of chuckled at that one. When we moved from city life to living on a dairy farm, I was warned my allergies would go wild and that I would hate the isolation and the smell. The funny thing about all of that is that my allergies totally cleared up and I rarely left the dairy – I loved the isolation. I adapted to my environment very well. As I listen to the rain pelting the roof and bouncing off our sky lights, I was thinking about how we seem to adapt well to wherever it is we live. And it happens relatively quickly. It drew me deeper into thought about our environment and how we adapt to it. What type of environment am I exposing my children to? What am I exposing myself to? What do I look at, listen to, or read? The old saying, “You are what you eat” came to mind, especially in light of Lent and fasting. It is Friday, and for most Catholics, a day of fasting and fish sticks. 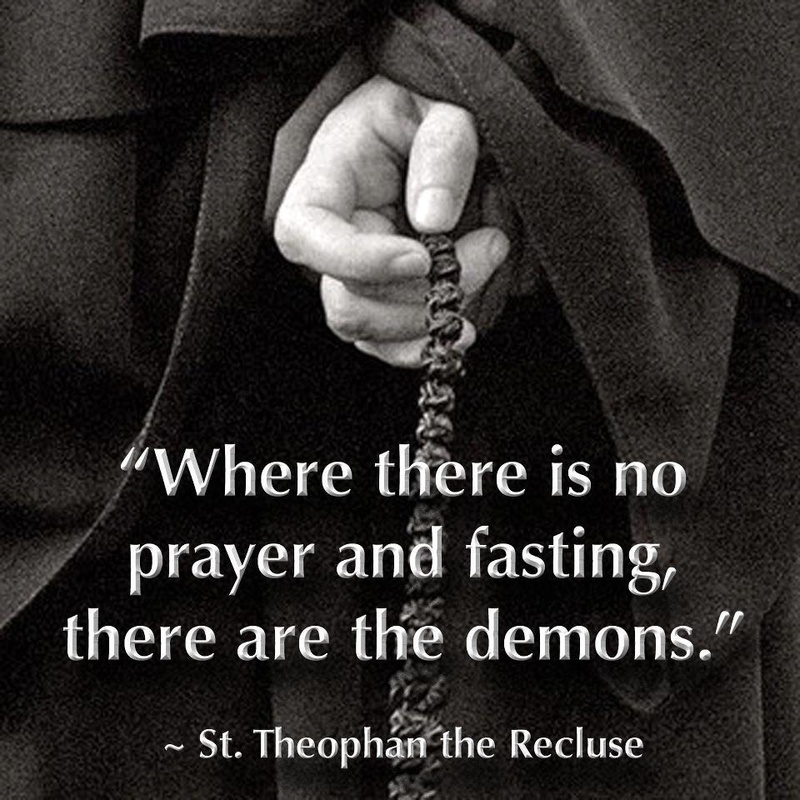 For us Byzantines (and now our Orthodox friends have begun the Great Fast as well) we fast from all flesh. Anything that is “self-motivating” or can move on its own, is not eaten. Melkites in particular also fast from olive oil and wines. In addition to Fridays, though, we Eastern Rite Catholics and Orthodox fast each and every day of Lent. I can tell you it makes the Easter feast truly a feast! But I digress…in a way. We all adapt to what is around us – even industry. McDonald’s brought out their “fish nuggets” for Lent – “Only around for a short time!” We try to fast as strictly as we can, but we occasionally stumble and eat a regular meal. Circumstances and schedules with our jobs and our children often cause us to drive through somewhere and grab food, on the way to somewhere else – we’re adapting (or compromising) the Great Fast for our schedules. We ask forgiveness as we speed off into the night. We often adapt our life to our “worldly” existence, rather than adapt our lives in the world to reflect our lives of faith. This is sometimes the only route we have, in that we must provide for our families and enter into the workforce. Quite often it is impossible for us to behave in a religious manner in places of business, most especially in America, where religion is definitely not something we share in the “marketplace.” My husband is an ordained Melkite deacon, but he does not wear the clothing that definitely identifies him as such to his place of employment. Latin Rite deacons wear perhaps a collar; Eastern rite deacons are often mistaken for Priests, as they dress almost identically to them. We have adapted our faith practices to our places of employment, and in the “world” or society in which we live. 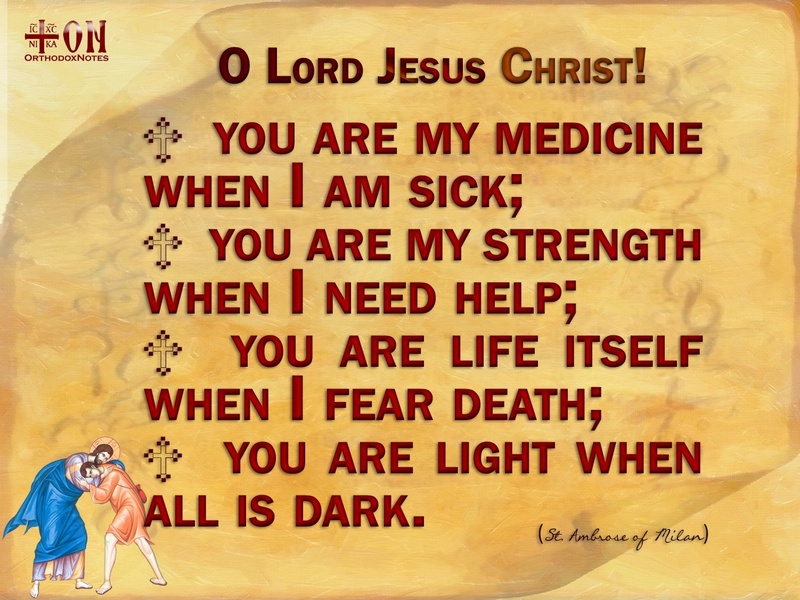 O Lord and Master of my life! Take from me the spirit of sloth, faint-heartedness, lust of power, and idle talk. But give rather the spirit of chastity, humility, patience, and love to Thy servant. Yea, O Lord and King! Grant me to see my own errors and not to judge my brother; For Thou art blessed unto ages of ages. Amen. I love this moment and this prayer, because it reminds me of who I am, what I have done, and what I have an opportunity to do. We need small reminders that we ought to take with us, into whatever environment we find ourselves. I believe people should inherently know we are people of God by how we treat other people. Co-workers, the clerk at the local Safeway, the hairdresser or even the postman, should know we are Christians because our faith determines how we treat others and how we are perceived by the culture around us. When I was working in a particularly chatty office environment a number of years ago, a young woman started to tell an off-color joke in my presence and then abruptly stopped. I asked her why she stopped and she told me it was because I was a “god” person and she didn’t think I would like her to tell that joke in my presence. I asked her why she would say that, as I had never once shared my faith with her. She told me it was because I was so nice all the time and that she noticed I always wore a cross and that I never used bad words or treated people in a negative way. Then she made me laugh, “Well, it’s also because you’re like our mom and I wouldn’t talk like that around my mom.” It engendered a wonderful conversation about how we should speak to others, I can assure you! But it made me smile, because I must have been doing something right! Elder Thaddeus says that if we have peace and love within our hearts and we are constantly contemplating the Face of God in our minds and our hearts, we don’t have to speak to people about our faith. Those feelings will permeate the air around us and people will just know it about us, and they will gravitate towards us. I think I lost some of that along the way and I desperately want that back. I do not want to adapt to the un-Godly, paganistic culture around me. I want to be known as a woman of God by everyone who meets me. I most especially want to be a woman of God to my children and grandchildren. And so I take this opportunity of Lent to re-examine where I may have lost this sense of godliness and I am struggling to soften my heart and let myself become, once again, a total daughter of Our Lord, Our Parent, Our Father. 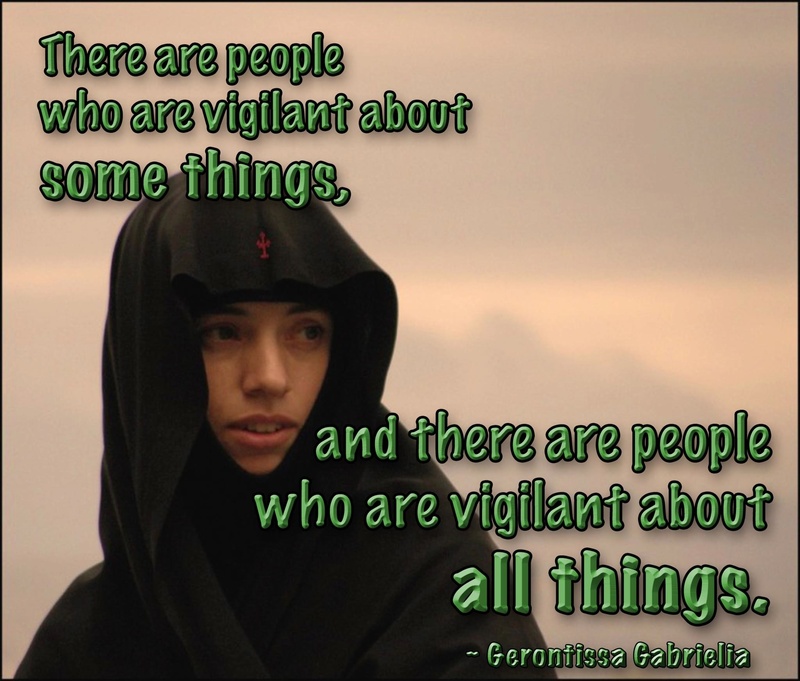 Now is the time the Church has set aside for me to become vigilant “about all things” and for me to re-focus myself. I am taking this time to re-evaluate how I have adapted to the culture around me, and how it has crept into the way I live my faith, and the decisions I make about the choices I am offered. Do I allow my schedule to determine my fasting, or do I adapt my schedule to encompass the Great Fast? Do I stop the media input from glaringly invading the peace of our home, or do I just ignore it as background noise? What can I do to make my life more God-centered and less centered on this world? I have started by lessening my attention to news and the TV. 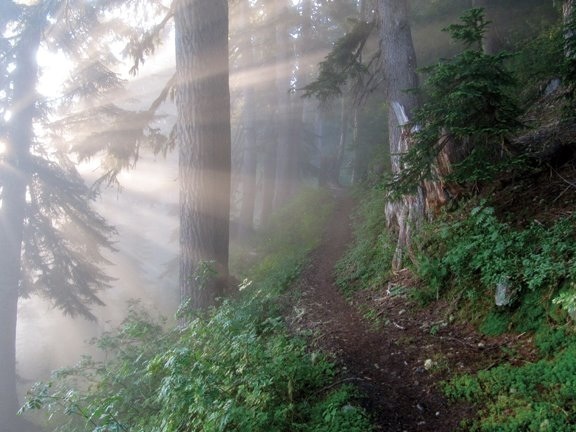 Elder Thaddeus was quoted in a previous post about how when we listen to the world, we find ourselves off-kilter and askew and are not sure why it is so; but when we examine the input, we realize it is the world, crowding out God. I am determined to be the person my grandchildren run to, for comfort and cookies and a story or two about the saints and God. I want them to know I pray for them and that I love them, just as I want their parents to know that. It is hard work, but the benefits are eternal. Yesterday was a traumatic day for my youngest son. As a parent, it is so hard to stand by and watch a childhood dream be shattered. And when it happens, it is often difficult to find the words to comfort someone. Adults, well, we are a little more used to having our aspirations shattered; we have hit some brick walls in our life’s pursuits. But children, children seem to have this purity of heart that just fills those around them with a sense of renewal of spirit and an inherent joy – life has not gotten to them, yet. My son’s dream, almost as long as we can all remember, has been to fly. He dresses in military garb almost daily. He knows so much about planes, he is like a walking encyclopedia. He loves the science of flying. He loves the smell of plane engines. He loves the sounds the engines make and can often identify the plane simply by listening to the engines. He plays on his flight simulator so much of the time, we are used to having airplane sounds in our family room! He joined the Civil Air Patrol so he could have that “high and tight” military haircut and it would be justified! He could wear Air Force uniforms and stand at attention, be grilled on military facts, chase down and find all those little strings messing up the perfect uniform that his CAP officers are always looking for, and polishing boots – spit-shines! Being in CAP also propelled my son into learning how to use a steam iron and starch – so his uniform would be perfect for inspections. And being in CAP insures his learning to fly. He tells us almost daily which branch of the military he wants to fly for, and what type of plane he wants to fly. A couple of years ago we were talking about different types of flying and I mentioned helicopters. His response? “Mom, I am just not a rotary blade guy. I am a fixed wing man.” I think he was all of 12 at the time! When we lived in SoCal, in the town in which we lived, was a wonderful air museum. After going through some particularly rough homeschooling curriculum, we were advised to ease off and learn to enjoy our son and to help him learn through experience. It was suggested to find something he liked and let him explore it to its fullest extent. We knew right away it was anything to do with flying, so we joined the museum. I found myself taking books to read and just sitting in this one particular area where they were restoring this big plane. He would kill me if he knew that I cannot remember what type it is (it is like the Memphis Belle plane)! While I sat in a military camp chair in a hanger, he would go and visit the men working on this plane at least twice a week; more if we indulged him. Gradually he got to know the men, all of whom were WWII or Vietnam vets, and they encouraged his love of flying. They presented him with posters for his room when he could answer questions about their restoration project correctly. He was infected!!! He was going to be a pilot. Period. And I think he will always find himself around planes, in some capacity. Yesterday, the eye doctor told him he would never fly for the military, or commercial airlines, because his eyes have degenerated too far. Now, my son is one of those stoics who rarely lets anyone see the real person. He was born that way. People used to ask us if he spoke at all, because he was so quiet in public, even as a toddler. As an infant, anyone could hold him and he never cried or complained. At home…completely different ballgame! Ha-Ha. Yesterday was no exception. I could see the pain in his eyes and in the way he shrunk about 2 inches in height. He just imploded upon himself. We had to choose glasses, because he now has to wear them all the time (prior to that, it was for seeing the chalkboard in a classroom) and so we had some chatter with the staff; he was pleasant but I knew he was roiling on the inside. The fun part was we ordered camo-styled glasses for every day and aviators for sunglasses! So he is still all in, insofar as military goes. The drive home was horrible. He was watching a DVD in the back seat, with the volume turned way up on his headset, and he kept letting out these huge sighs, while gently tapping his thigh. I wept, silently, at how quickly our dreams can be totally dashed on the rocks of this world. My baby was really hurting and it hurt me almost as much to see it happening. When we got home, I immediately went to my computer and researched Lasik surgery and military pilots. There is an off-chance that with one of two procedures the military allows, he can still fly. I am calling that eye doctor today to let him know his presumptions about military regs is completely outdated!!! I don’t want him squashing another child’s dreams. And so we are starting a special savings account that all of us, even our son, will deposit into, specifically for his Lasik surgery. We have to wait until he is 16, at the youngest, so we have some time to invest in his future. He has four years to prepare himself for the military, and we can still support him with that goal. We do not know what the future will hold and with our move coming soon, our new home may provide experiences he has never had, allowing him to perhaps fly, but in a completely different way. God is good and I know this happened for a reason. As I stood at the foot of the stairs, cradling my son as he wept into my shoulders, I cried right along with him. He whispered into my ear, “Mom, all I want to do is fly.” At that moment, it struck me – this is what being a family is all about. And I told him so. We are here to support one another, to pray for one another, and to assist one another when the road gets tough. No one is expected to go through life alone. We are community, and within our community, we are family. We are called to love one another; to love even our enemies. And I shared with him that we are still on that road to flight; there are just a few side trips we need to make. Sometimes we need to rest on the journey, as Mary and Joseph did on the Flight to Egypt. Sometimes we have to take side trips we had no intention of making, but which will make us better people for having made that journey. I also shared that God is faithful to us. He answers all our prayers, all the time. God will often answer in ways that may not be clear to us at the time, but which are for our benefit, and for helping us be closer to Him. As Elder Thaddeus said in his book, “God doesn’t need our prayers. We need our prayers.” Prayers help us center ourselves, quiet our minds, and get us back in tune with our Father, our Creator. Our sons all have three names, in addition to their surname. They have a first, second, and middle, along with their last. We felt it was better to give them as many intercessors as they could get, and we all chose their confirmation names, together. This particular son has Michael and Thomas in his name, along with an apostle for his first name. I told him yesterday that if he does not ask these great Saints to intercede in prayer for him already, he needs to invoke their prayers now. St. Michael is the patron of all branches of the military. Ask St. Michael to lead your heart where it needs to go; your path where God would have you walk. We Catholics, Byzantines, and Orthodox all believe that everyone who is alive, or who has passed on to life with Christ, can pray for us. If I ask you to pray for me, you will oblige because you are my friend. The Saints walked before us and surround the Throne of God; we believe they belong to the Church – the Church Triumphant. They can pray for us, too. 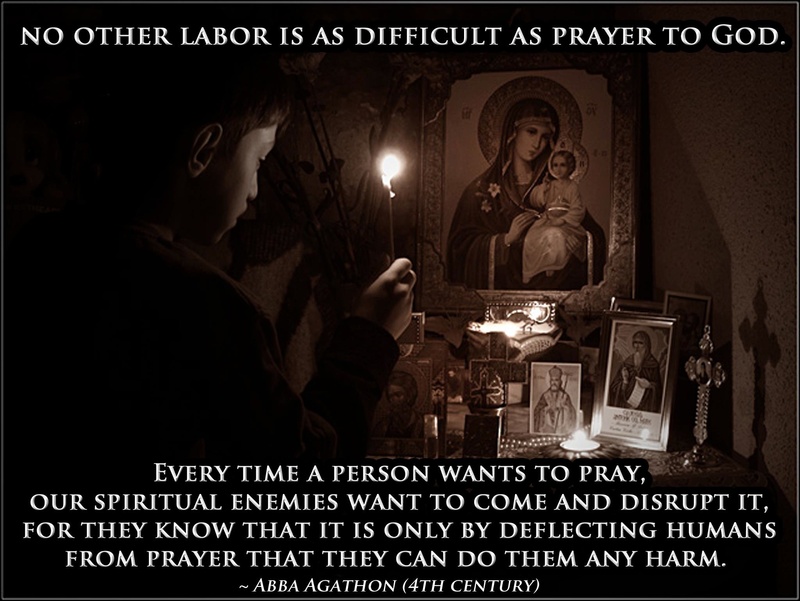 We do not pray TO them, but we ask them to pray for us. 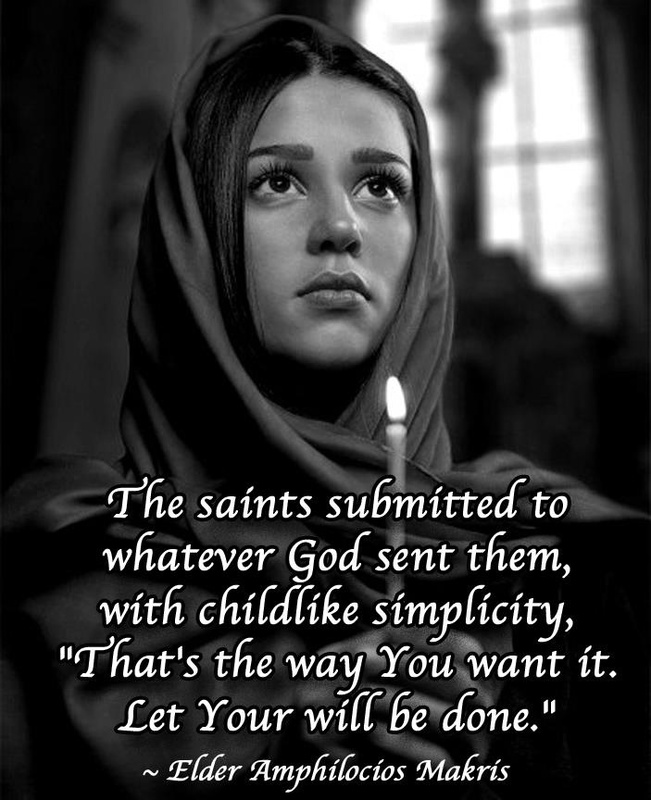 Just as we can feel the comfort when we know a prayer chain is invoking God for us, so, too, we can feel comfort when we know the Saints, who see the Face of God at all times, pray for us. The Church Militant is all of us, here, fighting the good fight and setting our sights on becoming part of the Church Triumphant, in Heaven, within sight of the Face of God. My son is better today. We went to dinner and had decadent IHOP pancakes last night! Totally Lent approved, as in no meat, but totally spoiling us, as in sugar content. Sometimes breakfast for dinner can be a real treat! It was great to see my son smile and hug his dad across the booth from me. We all chatted and laughed about things other than his eyes. Then we talked about them, too. He said he feels like there is hope, where he did not feel any hope at the doctor’s office. He also said that he realizes there are other things out there for him, and that he wants to always be around planes, but he realized he can do other things, too. So that is a good thing. His world grew a little bit yesterday, and this morning, he is wearing blue jeans and a t-shirt – not a military uniform! (A bonus day for me! I get so tired of the military camo all the time!!). And when I hugged him today, he smiled and said, “I love you, mom.” Made my day! Today my son is going to work on some science and some CAP exams he wants to pass so he can promote in rank. His outlook is good and his face is smiling. I know his heart is still hurting a little bit, but we are all determined to assist him in reaching his goals, as most families do for one another. I told him last night that his brothers and parents would do anything for him, even to move mountains, because we love him so much. Knowing you are loved helps facing any giants or dragons in life that much easier. God is good; He is always near. I have been stimulated to place words down here again by something someone said, and something I heard and/or read. For me, blogging about things is a way for me to communicate with myself, my husband, family, and friends. More often than not, my stimulus to write is because I am reading or listening to someone, and it gets my mind reeling with possibilities. Today is no exception. I read some articles yesterday about the Pope’s resignation and how the world, most especially the mainstream media outlets, do not get Catholicism, or organized religion, at all. 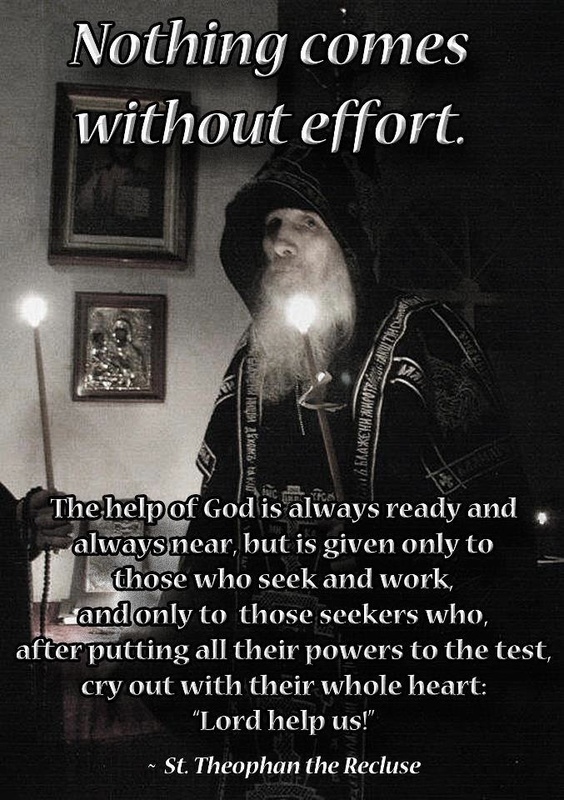 The other things were an article by an Abbot I love and the introduction to St. John Climacus,’ “Ladder of Divine Ascent,” which is my other reading for Lent this year. All of those combined, in odd, very odd, ways to bring me to write. Very few in the western mindset of democracy understand those of us who opt to unite our journey towards God with an organized religion. Most of the world (especially the western world and most especially, America) has listened to soundbites throughout history and has allowed those limited words to explain 2,000 years of history and tradition. In my own family, I am the sole practitioner of organized religion. Quite often, even among friends, I am the die-hard of Byzantine practice and that is rarely understood, as it differs so much from Latin or Roman Catholicism, as well as most Protestant denominations. In the forward to the “Ladder of Divine Ascent,” the author explains that most western eyes look to monastics as “different” and even the words surrounding monasticism as “different.” There are a few Roman Catholics who have discovered the wealth contained in monastic orders and they flock to the monasteries for Mass and prayer, even confession, whenever they can. 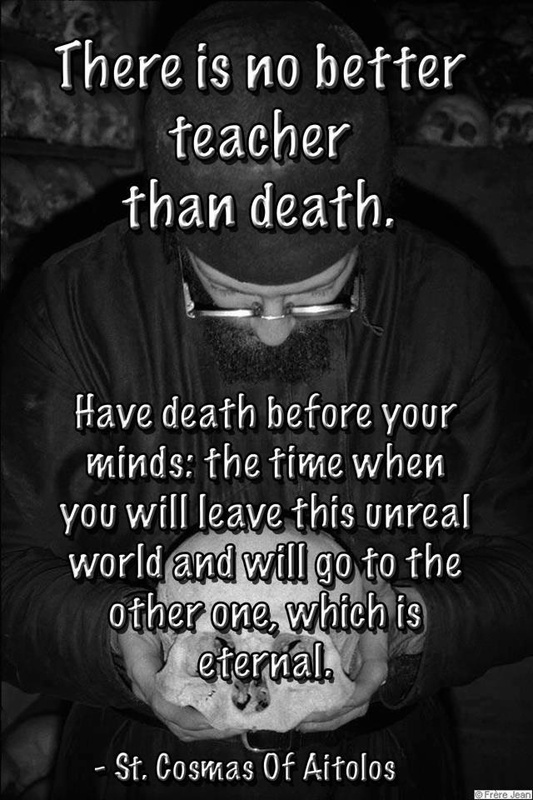 In the Eastern side of the Church, we breathe with our monastics; we turn to them as friends, as confidants, as Spiritual Fathers and Spiritual Guides. One of the incredible gifts of being Byzantine is that we are generally a part of either a monastery itself, or we attend quaint little parishes. The priests and monks are not strangers; they know us. One of the great joys I experienced was attending a conference on Byzantine spirituality of some sort (it may even have been a Melkite Greek Catholic conference…I am not certain and that part of it did not resonate with me) and the most important thing that came out of it for me was the camaraderie that developed within the small group we came to associate with. My husband, being an ordained Melkite deacon, immediately congregated with his fellow deacons. We wives also congregated together. With us, we added a coupe of priests, an archmandrite, and a Bishop. We had the most amazing dinners together and ended up, all of us, in our hotel room, gabbing the night away. I was in awe of the level of intelligence, humor, and love for God and His Church that surrounded me that night. The other deacon’s wife and I huddled in the corner and we whispered together about how cool it was, to witness the repartee that was taking place and the amazing thing (for women) is that neither of us felt the need to speak; we just drank in all the wonderful conversation around us. It is very rare for something like that to occur within other denominations. The priests, Bishops, and other clerics are just not that available to their people. And because I have barbequed, fed the poor, prayed, and worshiped with priests and deacons, I feel so close to my Spiritual Fathers, and so do my children. It is a blessing. This morning I read an article that explains why we women love to talk. Well, it is not something new under the sun, but scientists can now explain it – biologically and chemically! I feel so much better about myself! Ha-Ha! But I point this out because one of the issues I struggle with is keeping silent. Sometimes silence gains you so much more than chatter. The noisiness of this world can cramp our relationship with God so very much. My son and I were sitting in a parking lot last night, waiting for someone to open the gates for our entrance onto a small, local, military base for his CAP meeting, and he made the most interesting observation: “Mom, have you noticed how much noise is all around us? Did you notice the sounds of all those cars and trucks as we drove here on the freeway? Even here, up on this hill, you can still hear the sound of all those cars!” And we chatted a little bit about how very noisy our world has become. He even said that he cannot wait to get out into the wilds when we move, to experience the quiet of nature. And I believe that part of the misconception about monasticism and keeping Holy Silence is due to the fact that we rarely are in a position of total silence; there is always a gentle humming of background noises, even in the quiet of our homes. And people are very uncomfortable in total silence. As we enter more fully into Lent, I am pulled to “withdraw” more and more from contemporary noises. As a chatterbox most of my life, being silent is something very few expect from me. Many years ago, a friend of mine who was also known to love talking, asked me to attend a weekend “Silent Retreat” at a monastery. I was scared to death – because I had never been quiet that long, and I was not sure I could do it. The first few hours were especially difficult, as my friend and I were roommates! They asked us to not converse – at all! We did talk over details about rooming together, but then we split up, in order to not talk, each of us exploring the monastery on our own. There were lectures off and on throughout the day, the Blessed Sacrament was exposed in a side Chapel all day and we could go there anytime we chose, and there were priests available all day for confessions, as well as all the regular prayer times throughout the day, common to monastic life. Where did I find myself? Well, I did not stroll the wonderful gardens, nor did I take advantage of the wonderful views, nor did I spend much time in quiet adoration; I was inexplicably drawn to their amazing two-storied library. Up in the rafters, a rickety “third” floor that was more like scaffolding, they had all the books they were getting rid of. For a book lover like me, I was delirious! I lost track of time, finding all these wonderful treasures to bring home! The smell of a library filled with old books is something only a book lover would treasure, and I did. I found a niche by a rounded window that I cracked open for the slight, warm, breeze and set to reading books by the Church fathers, some old priests, and even books of prayers. I found myself startled by the sound of the dinner gong. And I had not spoken a word in an entire day. It was actually miraculous. My weekend flew by and my friend and I scheduled that same retreat for several years in a row (until we had just too many children to leave our husbands alone for that long! Ha-Ha!) and we both marveled at how silence was something we both looked forward to each year. Now that I am older and my home is less chaotic than when all my sons were running through it, I find that keeping quiet is not that difficult. And I have, on occasion, answered a phone call with a cracked voice, realizing I have not spoken in hours. And you know what? I have learned more and heard more in silence that I ever have in noise. The Lord, it is said, comes in a “whisper.” We have, jokingly, said many times in our family that God needs to use a 2 x 4 so we are sure we get His messages! But I am learning that in the stillness of my heartbeat, and in the quiet of breathing, God is more present to me. 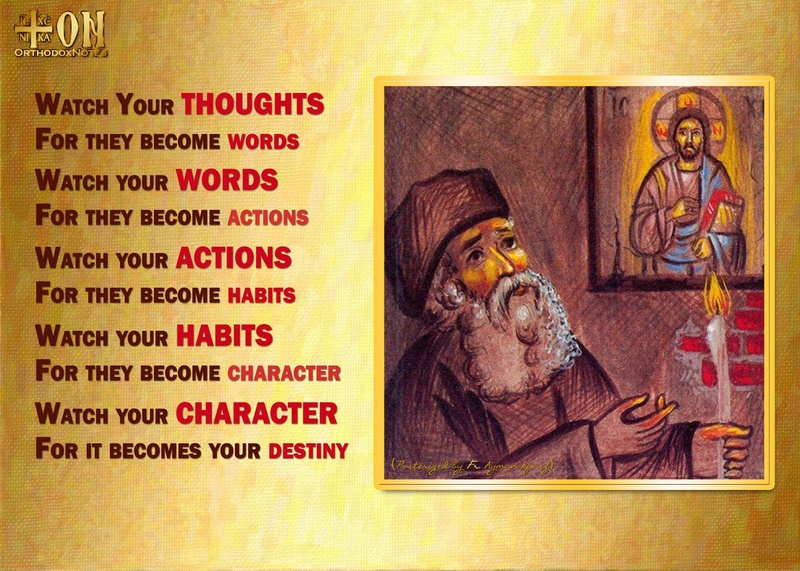 I am learning to control my thoughts (thanks to Elder Thaddeus and his book, “Our Thoughts Determine our Lives”) and keep my life from becoming too much about all the stresses that assail us on a daily basis. I find myself reciting the Jesus Prayer, or the Prayer of the Heart, more often during my day (“Jesus, Son of God, have mercy on me, a sinner.”) and will often stop to place my mind fully on the prayer. It is amazing when you have these little prayers you can offer all day, how settling they can be. God is pleased when we give all that we are and all that we do, over to Him. After speaking at length with a friend experiencing a crisis last evening, I shared how much we can change a situation by turning things over to God. 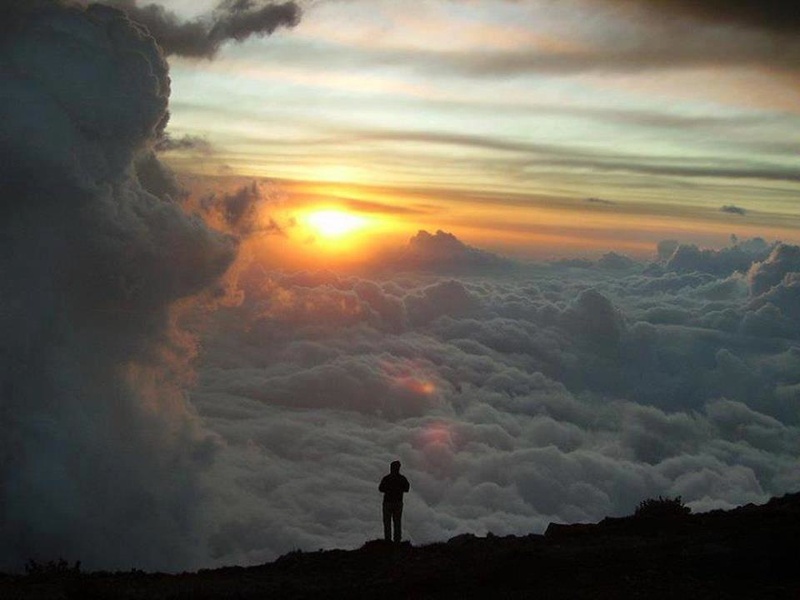 There is this amazing book, which I have quoted before in my posts, called, “Everything You Wanted to Know About Heaven, but Never Dreamed of Asking,” by Peter Kreeft. In that book, he wonderfully speaks about truly giving everything over to God. He describes a closet in our hearts/minds that we dedicate to God. In that closet are shelves, with shoe boxes lining them, each with a label on it. Each box is labelled for that particular thing or issue (or person and personal relationship) that you cannot handle on your own. You place that thing in the box, giving it over to God, and close God’s closet door. You truly have to picture yourself giving this thing to God. I have all sorts of things in God’s closet. Because I have that wonderful gift of free will, I will often yank that thing out of God’s closet and think I can handle it on my own. Once more, God, Who is ever patient with us, will show me that I cannot handle this on my own. He gently opens that door and I see quite clearly that box, with its lid askew, asking for my “thing” to be put back inside of it. God is more faithful than any friend we have, who offers to help us out. God will always come through for us. His method, His time, His way…but He always answers our prayers. And sometimes praying can be the single most difficult thing we do. We also will, more often than not, forget to pray for ourselves. We always pray for our husbands, children, friends, community and country; but most of us forget to ask God for something. In the season of Lent, boy oh boy, do I seem to dump everything into God’s boxes!! His arms are full of all the verbalized shortcomings I have come to own. But the funniest things is, He already knows all of that about me. He knows where I am weak and where my strength lays. He is just waiting for me to humble myself, realize that I can do NOTHING without Him, and to simply implore Him for His intercession in my life. St. John Climacus’ book, “The Ladder of Divine Ascent,” is the other book I am trudging through this Lent. He addresses our incessant need to talk in his book, as so many scholars before and since have done. One of the messages that came to me was my tongue praises God; my tongue receives God in Holy Communion; my tongue shares my faith with others. My tongue is a holy instrument. How can I defame myself through my words? How can I defame my Lord and my God through profanity? How can I allow negativity and strife to surround me and those near me, through my words, said with my tongue? There was a joke emailed to me this week, about a police officer who came up behind a woman who was gesticulating at an intersection, and yelling and screaming, at the car in front of her. He pulled her over and arrested her. She was brought to jail, fingerprinted and photographed, and left in a holding cell; she was hysterical, not knowing why. He later came to her and apologized, saying that he thought she must have stolen the car because she had bumper stickers like “WWJD,” and “Pro-Llife” and “God Saves” and many more on the back of her car and so he thought that her behavior must have been that of a thief!! We are all tempted to stray; we are all fallible; we are human. The point is to get back up, dust ourselves off, and re-start on the journey we have begun. For me, when my mouth gets tired and I realize I have been talking too much, too long, over trivia, I will quite often stop mid-sentence and sit back, realizing I have not only broken with my efforts at “Holy Silence,” I have outdone myself in the chatter department!!! 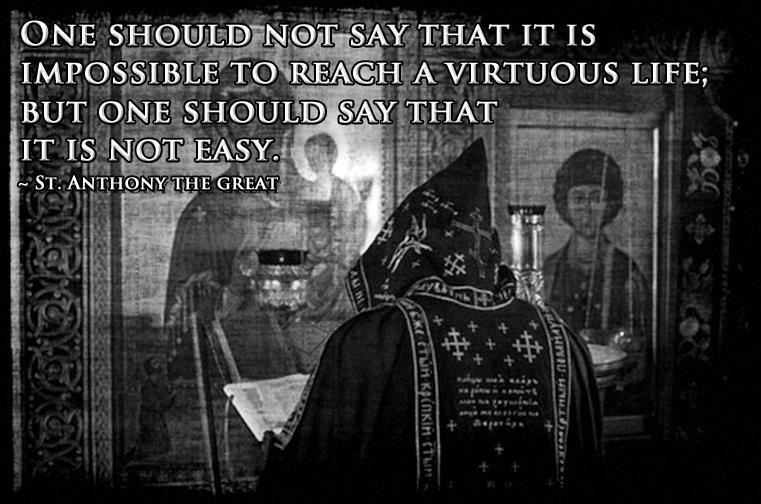 As St. Anthony the Great tell us, it is not impossible to reach a virtuous life, but it certainly is not easy! I take great comfort in his words, because I know that God expects a struggle. Christ told us: “Do not suppose that I have come to bring peace to the earth. I did not come to bring peace, but a sword. For I have come to turn a man against his father, a daughter against her mother, a daughter-in-law against her mother-in-law—a man’s enemies will be the members of his own household.” (Matthew 10:34-36). And because He promised us struggles, even in our own families, why would we expect Lent to be easy? The purpose of these 40 days is to struggle. We are supposed to work towards becoming better at day 40 than we were at day 1. At the very least, if we spend Lent wisely, we should know more about ourselves at the end of it. And perhaps we will have picked up some new, positive, habits along the way. I propose to become a more centered, loving, quiet woman by the time I am praising God on Easter Sunday, for His gift to me of “Eternal Life.” A gift that I am praying I will become more cognizant of, and worthy of, through this struggle we call Lent.